free Wi-Fi in guest rooms. and more than a dozen food and beverage outlets. Big, bold, and beautiful, Rosen Shingle Creek offers a premier meeting destination at the center of the action along Universal Boulevard in Orlando, Florida. Pioneers once camped on the banks of cypress-shaded Shingle Creek, which fronts the 255-acre hotel grounds. Never did they dream their campground would one day showcase a grand convention hotel — one of the largest meeting and trade show venues in the state. More than half a million square feet of meeting and event space hosts groups of every size, up to 10,000 attendees. The choice of 99 function rooms ranges from three column-free ballrooms of 40,000 to 95,000 square feet to 30 refined hospitality suites for intimate corporate affairs. While the participants get down to business, the 1,501 guest rooms and suites stand by as soothing AAA Four Diamond Award-winning retreats for relaxation after busy days. And speaking of busy days, to enhance the overall meeting experience, the hotel adds more than a dozen restaurants and lounges (ranging from deli to fine dining); four outdoor pools; the 18-hole, par-72 Shingle Creek Golf Club and Brad Brewer Golf Academy; and The Spa at Shingle Creek, complete with treatment facilities, fitness center, and salon. The sprawling acreage even allows for a secluded nature trail and a fishing dock. Plus, of course, the location gives easy access to Orlando’s boundless attractions to complete a winning mix of productivity and pleasure in central Florida. Rosen Shingle Creek was built intentionally for meetings and it shows. There is ample, well planned meeting space and moving between break outs, general session and evening events is a breeze. Our production team loved the single level move in and the large loading docks and the technology infrastructure is fantastic. Their built in registration desks have great lockable space behind them and good visibility and access to other spaces. Their staff treats each other, and their clients like family. They are warm, friendly and highly capable and working with them was truly a pleasure. We had lots of tight turns and last minute requests that they handled flawlessly and always with a smile. Their food and beverage team is great and very innovative. We had to customize most of our menus to allow for budget issues and they met the challenge without compromising quality. The food was very, very good and our attendee feedback reflected as much. The guest rooms are clean and nice. I would not consider this a luxury resort, but that wasn't what we needed for our sales meeting. The amenities are standard and the soft goods feel a little dated, but the group rate we secured was exceptional for such a nice product. For the large sales meeting that we hosted, this property was perfect. I would return with the same kind of group again and again. I did not give the hotel five solid stars, because I feel like it is a little too convention friendly for a smaller, high end meeting. They do, however, have a spa and golf onsite and partner with great DMCs that could bring something special to their space or deliver high end offsite events. Bottom line: amazing hotel for a large group with the best staff in Florida. From the pre planning stages to on site operation to post meeting wrap up, the staff at Rosen shingle creek didn't miss a beat. Right the first time execution is their mantra and you see it at every stage of the planning process. As a result, the attendees walk away with a great hotel/meeting experience. Convention space is well laid-out and easy to navigate. F&B experience was delightful. Staff demonstrates pride and positive attitudes. ORLANDO (March 2, 2017) – The AAA Four Diamond Rosen Shingle Creek in Orlando is giving travelers a better way to recharge – mentally and literally. The hotel, which continually strives to exceed guest expectations, has completed extensive refurbishments to its grounds and amenities, creating more ways for guests and business travelers to gather, connect and recharge. Modern enhancements increase the guests’ ability to relax and mentally recharge while technology upgrades throughout the hotel give guests more opportunities to recharge their electronics. All 1501 guestrooms and suites, the hotel’s grand lobby and many of its retail, restaurant and lounge spaces have been refreshed with a more contemporary Spanish revival-style design. The hotel’s 18-hole championship Shingle Creek Golf Course recently unveiled an innovative redesign courtesy of Arnold Palmer Golf Company, along with a new open-air covered pavilion for 19th hole events. Each of the spacious guestrooms now reflect even more of the magnificent natural beauty of the Florida landscapes and nearby historic Shingle Creek, headwaters to the Florida Everglades. Redesigned in shades of soft coppers, sky blues and teals, the guestrooms feature sophisticated lighting and richly-dramatic two-toned flooring. The crème brulee and chocolate carpeting has a cut-and-loop pattern for more depth. Sheers have been added to the oversized picture windows add to the open feel of the 436-square-foot spaces, which are among the largest guestrooms in Central Florida. Animal print and faux-leather ottomans now join each plush guestroom chair for more comfort. The new interiors in the dining and gathering areas meld the traditional and contemporary into a transitional feel that includes technology-friendly recharging stations and power outlets, creating a perfect home away from home for seasoned business and holiday travelers. Enhanced communal seating areas in the VIP Lounge, Headwaters Lounge, Mi Casa Tequila Taqueria and new Tobias Burgers & Brews now provide hidden power outlets beneath tabletops for convenience while enjoying the inventive dishes and lively atmosphere. Outlet-based lamps, similar to those popular in the hotel’s guestrooms, are featured throughout the lobby, allowing guests plenty of spaces to recharge their electronics while the hotel-wide complimentary Wi-Fi ensures that even the data plans of the most technology-reliant business people and families get that much-deserved break. Rosen Shingle Creek features close to a half million square feet of indoor and outdoor venues, including 99 meeting rooms, 10 outdoor spaces and three column-free ballrooms. Many of these spaces, including select restaurants, social hubs and the lobby area were refreshed with warm, sunny hues, designed to bring in the grounds’ natural charm. Upon entering the lobby, accents of tangerine and honeycomb echo the dramatic two-story view of the Orlando sunshine. Two new, modern, painted metal murals join the high-back circular banquette seating and technology-friendly lighting. A deeper color palette brings more drama to the lobby’s architectural features and the carpet’s water droplet pattern again harkens back to the hotel’s natural setting. The traditionally transitional lobby now affords more places to slow down from the hustle and bustle with the incorporation of intimate library and seating area in a nearby alcove space. The Terrace Lounge has a newly-enhanced area for the concierge and guests to enjoy outdoor views. Island seating and modern sofas were added in clean shades of champagne and its modular seating can be easily moved to create impromptu space for casual meetings. Island seating faces the large window views, framed by asymmetrical, sheer window treatments. A connected, small outdoor lounge now has cushy, modern chairs that swivel toward the pool and golf course. Nearby at The Spa at Shingle Creek, the women’s relaxation room was expanded and furnished with plush seating in teals, taupes and silvers, where guests can enjoy spa refreshments like chocolate-covered strawberries. Connecting the lobby to the convention center, Rosen Shingle Creek’s “Dining & Spirits on the Boulevard” walkway has elevated the hotel’s 15 dining and lounging options with new seating, design refreshes and a rebranded restaurant. Tobias Burgers & Brews received a total makeover, from look and location to name and menu. The casual dining option focuses on gourmet specialty burgers, premium bourbons and whiskeys and more than 30 local craft brews of which 18 are on tap, including the company’s own Alligator Drool. Guests can enjoy beer flights alongside other options like salads, artisan flatbreads, traditional pub fare and specialty burgers like The Bourbon featuring a Kentucky Bourbon glaze. Its ambiance harkens to a clean-lined industrial trendy brewer feel with mixes of metal and glass elements. Exposed ceilings, garage-style windows, pipe lighting, custom copper beer taps and an open food prep area highlight the new 45-seat restaurant. The floor was given a more metallic look and corrugated metal sheets provide a backdrop to the venue’s extensive bar selection. Accents, such as sconces along the brick wall, bring together the restaurant’s fusion of textures and metals. Mi Casa Tequila Taqueria, one of Rosen Shingle Creek’s newest restaurants, had become so popular in its few years that it, too, needed to be expanded to offer more seating. Now with a capacity of 100, its old-world, Mexican-style food and décor was made modern with in-table charging outlets and seating options for singles or communal tables up to ten. Old, rustic Mexican tiles and hand-painted pottery elements are set off by cobalt blue glass accents. With both traditional and bar-style seating, the restaurant features traditional Mexican fare like hand-crafted margaritas and fresh guacamole that is prepared to order tableside. The Headwaters Lounge received new flooring, bar fronts and acrylic paneling in shades of greys, silvers and taupes. Six high-top tables for eight with integrated electrical outlets now join the lounge’s sleek, modular, serpentine tables. The taupe, coffee table-like pieces can be arranged for casual meetings. BJ’s Gift Shop, located among the walkway’s restaurants, received new custom displays in neutrals and blacks, chic backlighting and an upscale chandelier to create an inviting shopping experience. Rosen Shingle Creek’s 14th Floor VIP Lounge is a keyed-access lounge staffed with two concierge and offering daily continental breakfast, evening hot appetizers and desserts and beverages throughout the day. This space was modernized with new four-top tables and chairs, along with a communal table for eight from which guests can enjoy the morning paper and serene views from the 14th floor. Tangerine-colored elements pop against a subdued gray and silver palate. A clean mix of wood, metal and stone and multiple power outlets help give this space a sleek feel, and silver lighting adds to the modernism. The library nook was updated with two cushy chairs and additional electric outlets for a total recharge. 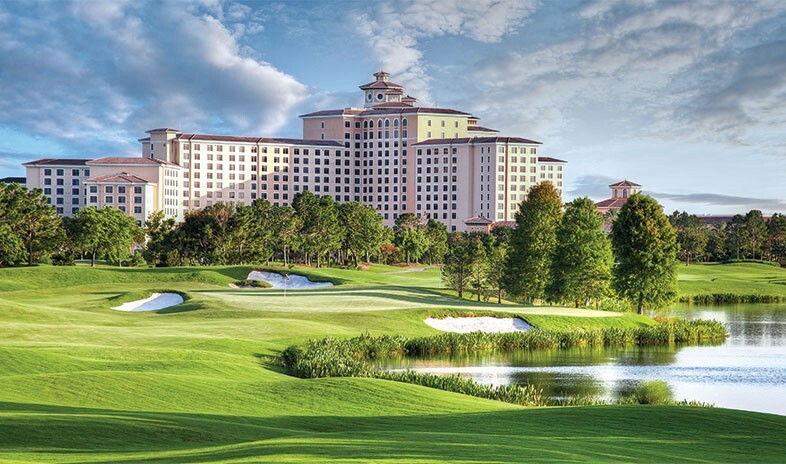 Outside on the hotel’s 255 acres, the 18-hole Shingle Creek Golf Course has been newly redesigned by Arnold Palmer Design Company and overseen by senior golf course architect and vice president Thad Layton. Layton’s team completely revamped three holes on a new 25-acre parcel and updated the balance of the course with new hazards and extra-long par 4s and 5s, while still preserving the course’s original natural beauty. Fairway-cut surrounds and runoff areas were incorporated to the course’s greens to increase the game’s strategy and give golfers of all levels more forgiveness and recovery options. The greens themselves range from 3,500 to over 9,500 square feet and highlight a variety of slopes, nobs and swales. The world-class golf club provides a 70,000-square-foot driving range and a 15,000-square-foot practice areas for guests to improve their short game. Both are located close to the on-site Brad Brewer Golf Academy, integrating state-of-the-art swing analysis and game improvement technology at the indoor hitting bays. The golf course update also included the construction of a 2,000-square-foot covered pavilion with serene views of the natural grounds, perfect for tournaments, parties, weddings or other special events.